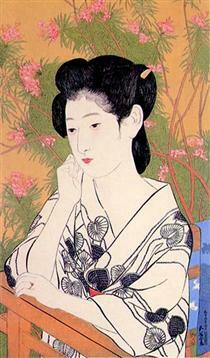 Goyō Hashiguchi (橋口 五葉, Hashiguchi Goyō, December 21, 1880 – February 24, 1921) was an artist in Japan. 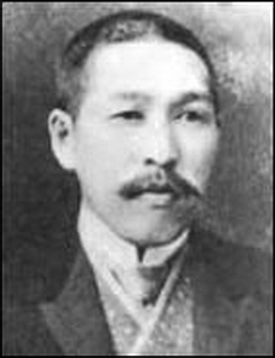 Hashiguchi was born Hashiguchi Kiyoshi in Kagoshima Prefecture. 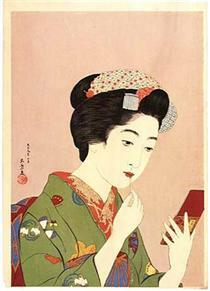 His father Hashiguchi Kanemizu was a samurai and amateur painter in the Shijō style. 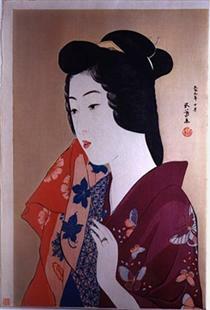 His father hired a teacher in the Kano style of painting in 1899 when Kiyoshi was only ten. Kiyoshi took the name of Goyō while attending the Tokyo School of Fine Arts, from which he graduated best in his class in 1905. The name Goyō was chosen because of his fondness for the five needle pine in his father's garden. His first commission was designing the layout and illustrations for Natsume Sōseki's novel I Am a Cat in 1905. This led to design of other books by Futabatei Shimei, Uchida Roan (ja), Morita Sōhei, Jun'ichirō Tanizaki, Nagai Kafū, and Kyōka Izumi. In 1907 Goyō won recognition for an ukiyo-e oil painting in the first Bunten show in 1907 but was disappointed in the unenthusiastic public acceptance of his oil paintings in future shows. 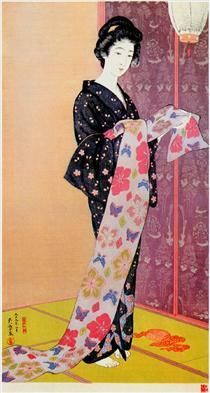 In 1911 he again won recognition for an ukiyo-e poster designed for the Mitsukoshi department store. 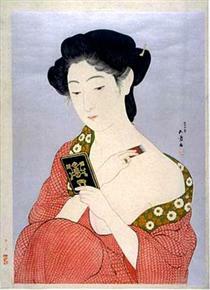 He then became a serious student of ukiyo-e. Goyō studied from books, originals and reproductions. He was especially interested in the great classical ukiyo-e artists and wrote several articles about Utamaro, Hiroshige and Harunobu. 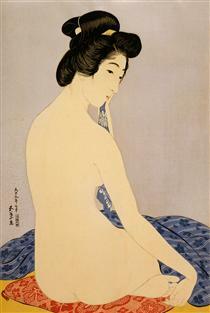 From 1914, while frail and suffering from beriberi, he contributed articles on various ukiyo-e studies to Art News (Bijutsu-shinpō) and Ukiyo-e magazine. 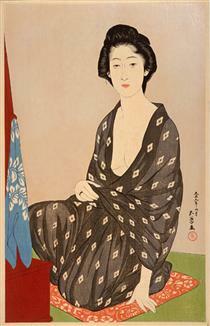 In late 1920, Hashiguchi's latent health problems escalated into meningitis. 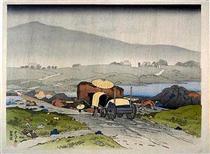 He supervised his last print "Hot Spring Hotel" from his death bed, but could not finish it personally. He died on February 1921 at the age of 41. 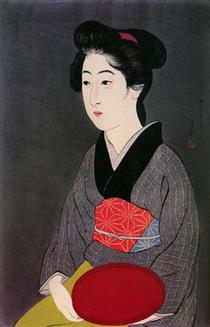 Goyō had left several sketches from which his elder brother and his nephew had later produced seven more prints. The carving and printing had been commissioned to Maeda Kentarō and Hirai Koichi. 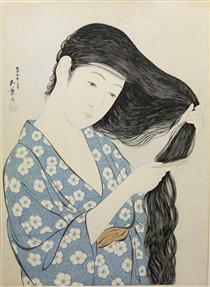 Goyō Hashiguchi prints are of extremely high quality standards. They were sold at very high prices at the time of their first publication and sold well nevertheless. The tragedy of Hashiguchi was the short time span of only two years to produce these superb masterworks - apart from his first print published with Watanabe.